If you've been reading the other parts (one, two and three) 0f this story, well, thank you! Here we are at part 4 and its looking good. One of the things you can do in Thunderbird is to have tags, or in GMail speak, labels, for your email. Thunderbird allows you to colour them. So does GMail. 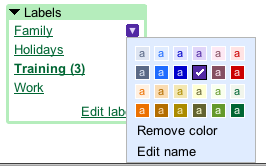 First create your labels, and then scroll down and then in the the small box to the right of the label, click in an select a colour.